Multi-Step Approach The VIMS report calls for a flexible, "staircase" approach for adapting to coastal flooding. Here's an example of such an approach for an urban area. Multi-Step Approach The VIMS report calls for a flexible, "staircase" approach for adapting to coastal flooding. Here's an example of such an approach for a rural area. Flooding Depth Simulation An example of a flooding-depth simulation map from the VIMS report. See report for higher resolution maps for this and other areas. Image courtesy of CCRM. Potential Flooding Zones An example of a map showing potential flooding zones under different scenarios of sea-level rise. See the VIMS report for higher resolution maps for this and other areas. Image courtesy of CCRM. Road Flooding Frequency of flooding of VDOT-maintained roads in Tidewater Virginia. See VIMS report for higher resolution map. Image courtesy of CCRM/Data from VDOT. Purview The VIMS coastal flooding study focuses on localities in Tidewater Virginia and the Eastern Shore. Image courtesy of CCRM. Recurrent coastal flooding—think Isabel, Ernesto, Irene, Sandy, the “Son of Ida,” and numerous other unnamed nor’easters—is a significant and growing threat to the people and places of Tidewater Virginia. A new report from the Virginia Institute of Marine Science, College of William and Mary, lays out a detailed plan for how the Commonwealth can best respond to the ongoing challenges that high tides, storm surge, intense rain storms, sinking land, and rising sea level pose to residents and localities along Virginia’s Chesapeake Bay and Atlantic shorelines. The authors of the report—which was called for by a joint resolution of Virginia’s House and Senate in 2012—made the 135-page document available to legislators this week for consideration during the General Assembly’s 2013 session. The report makes clear that no single response will fully address the complex web of social, legal, and environmental issues that contribute to Tidewater’s vulnerability to coastal flooding. Instead, it calls for a multi-step approach with enough flexibility to allow policymakers to adapt as conditions change and knowledge grows. It also says the time for action is now. The report—Recurrent Flooding Study for Tidewater Virginia—is the result of a yearlong effort by researchers in VIMS’ Center for Coastal Resources Management. The study was led by Ms. Molly Mitchell and CCRM Director Carl Hershner, with input from an advisory panel that included colleagues at VIMS, Old Dominion University, the W&M Coastal Policy Clinic, the Hampton Roads Planning District Commission, the Accomack-Northampton Planning District Commission, Wetlands Watch, relevant state agencies, as well as cities and counties throughout eastern Virginia. The study’s authors collected data and analyses from agencies at the local, state, and federal levels, as well as from non-governmental organizations and regional authorities such as the Chesapeake Bay Program. They also reviewed a comprehensive list of strategies used in other vulnerable areas around the U.S. and world, including New Orleans, the Netherlands, the United Kingdom, Japan, and other smaller Pacific islands. The report breaks potential adaptation options into 3 main categories: management, accommodation, and protection. Management includes zoning policies aimed at discouraging development or rebuilding in high-risk areas, and the reclamation of flood-prone lands. Accommodation—currently the most common approach in Virginia—includes raising buildings and roads, establishing evacuation routes and warning systems, and creating or enhancing storm-water systems. Protection measures include levees, seawalls, and tidal gates, as well as “soft-engineering” structures such as living shorelines and created marshes. This approach can be visualized as a staircase, says Mitchell, with each step raising a locality’s resilience to its particular flooding risk. They note that combining “hard” infrastructure, like a levee, with “soft” infrastructure, like a created marsh, can protect while adding to the quality of life for local residents. “Created marshes, nourished beaches, and other open spaces can beautify and contribute recreational and economic value while still providing flood protection,” says Mitchell. 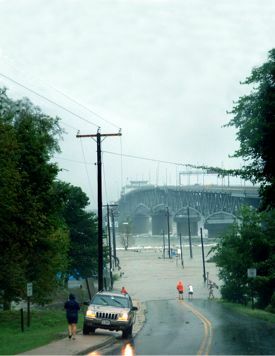 In terms of funding the planning and implementation activities needed to reduce Virginia’s coastal flooding risk, the report recommends state authorization and support, with cost-benefit studies to help prioritize projects. Hershner says this recommendation is based on concerns with Virginia’s Dillon Rule, which holds that localities only have the authorities specifically given to them by the state. A second concern is that all but one of the agencies involved in planning for sea-level rise currently use past conditions to predict the future—and thus cannot incorporate the growing evidence that the rate of sea-level rise is increasing. The report includes numerous maps showing areas of potential flooding in light of sea-level rise. The maps assume a 1.5-foot rise in sea level and a 3-foot storm surge. 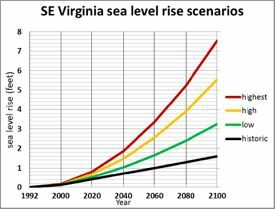 These represent moderate assumptions, with the value of sea-level rise well within the range of the best available forecasts for Virginia over the next 20 to 50 years. One way to make these maps more accurate, say the report authors, is to continue to update existing coastal elevation maps using LIDAR, a high-resolution mapping technique that uses laser light to gauge ground elevation.